This newly published epic volume arrived in the SDC office, and is an impressive encyclopaedic guide to wearable printed fabrics. 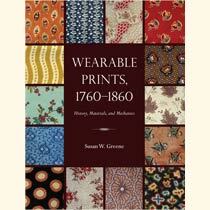 The result of many years of research and study, the book looks back at the early methods of printing dress fabrics. The dyes, the processes, the designs and the industry are all covered in detail and beautifully illustrated with photographs, diagrams, drawings and charts. Wearable prints are not only a decorative art form but also the product of a range of complex industrial processes and an economically important commodity. But when did textile printing originate, and how can we identify the fabrics, inks, dyes and printing processes used on surviving historical examples? The author surveys the history of wearing printable fabrics, which reaches back into the earliest days of the discovery of the delights of selectively patterned cloth and is firmly interwoven with the Industrial Revolution. There are 1600 full colour images in the book, including lots of textile samples. Back in 2001 the book’s author Susan Greene approached the SDC and subsequently visited what was then the Colour Museum (and is now SDC’s Colour Experience) and took several photographs of equipment and pattern books in our archive which appear in the book. The information gleaned from her visit augmented her research in archives and museums in the United States and the involvement of the SDC is duly acknowledged at the start of the book. Susan is a collector, museum consultant, independent scholar and author of Textiles for Early Victorian Clothing. Her collection of late eighteenth and early nineteenth century clothing now resides at the Genesee Country Village and Museum in Mumford, New York. This is a remarkable collection of nearly 3,000 rare, mostly nineteenth garments and accessories, with around 300 items on display at any one time. Although there is some formal attire, the focus is on everyday clothing worn by ordinary people – clothing that rarely survives. Among the very earliest examples are lace edgings which date to around 1650. An incredible collection, and well worth a visit, if you happen to be in New York state. If not, Susan’s book is definitely worth a look!